Velvet galls are some of my favorite galls and can be quite beautiful. 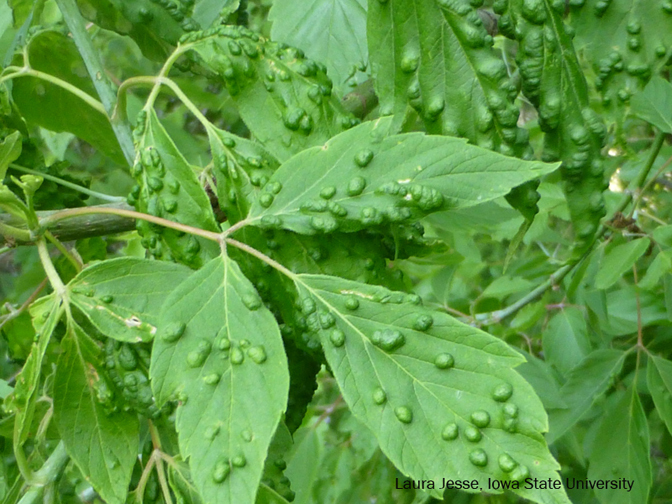 This spring I have noticed numerous velvet galls on boxelder trees. From the top the leaf surface has small raised bumps. 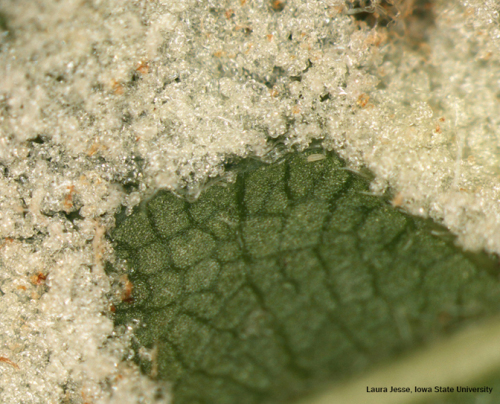 On the underside of the leaves you can see the white velvety growth of the gall caused by microscopic mites. The velvety tissue is part of the plant and produced by the plant in response to the mite feeding. The extra plant tissue provides protected feeding sites for the mites. The mites are called eriophyid mites, which is a large group of plant feeding mites that cause a variety of galls and distorted growth on plants. In the case of boxelder trees the culprit mite is the boxelder pouchgall mite, Eriophyes negundi. Each eriophyid mite species has a limited range of plants it can feed on, but there are many species that feed on a wide variety of trees and plants. 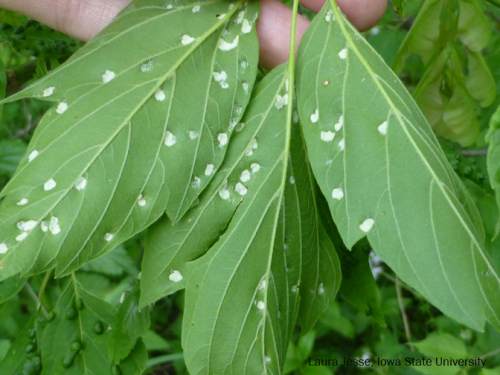 A large number of galls can cause the leaf to be small and distorted. However, in the case of the boxelder tree the galls are harmless and even distorted leaves are still photosynthesizing and doing what they need to do. Treatment is not recommended as thorough coverage beneath leaves is difficult to achieve and the galls have already been formed and will remain all summer. Natural enemies such as predatory mites and thrips help keep populations of the eriophyid mites under control. Blisters of the boxelder pouch gall protrude about the upper leaf surface of boxelder foliage. Boxeder pouch gall seen from the underside of foliage. Close up of erineum gall. Notice tiny mites at the edge of the gall! The foliage on my tulips and daffodils has been damaged by record cold temperatures in early spring. Should I cut off the damaged foliage?